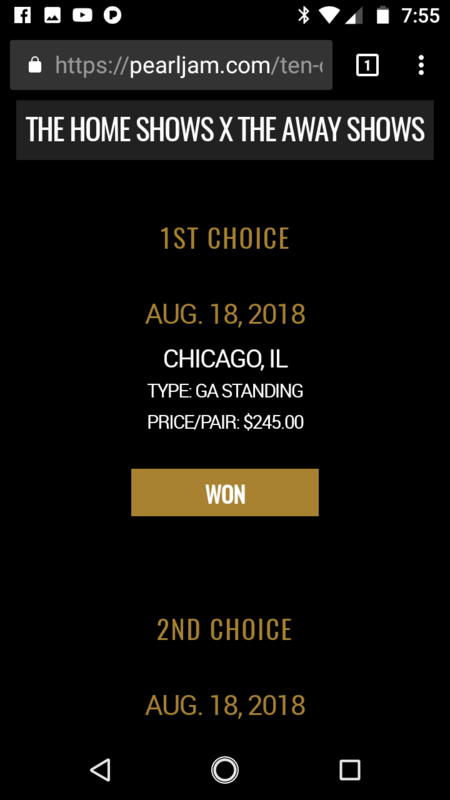 Very happy to say that I won GA for Chicago 2, my first choice. OH yeah!!! Last name M. Put in request Thursday. Oldest child. Bats and throw right handed. Goofy foot surfing/snow boarding. This will be our first time seeing Pearl Jam live. So excited! Won my only entry, Wrigley 1 reserved. My girlfriend won her only entry, Wrigley 2 reserved. Won Seattle night 1 Reserved. Booyeah!!!!! 1st Seattle night 1 GA -- WON! 2nd Missoula GA -- WON! 3rd Seattle night 2 Reserved -- WON! Won reserved for Boston 1 and 2 this afternoon. My girlfriend is still waiting for Chicago 1 reserved, I am still hoping for us, she lost faith unfortunately. Won Fenway 1. Entered on Friday morning. Won Sea 1 GA. Lost Sea 2 GA. Bos 1 reserved. And for shits and giggles. I did Chi2 and Chi1 GA for 4/5. 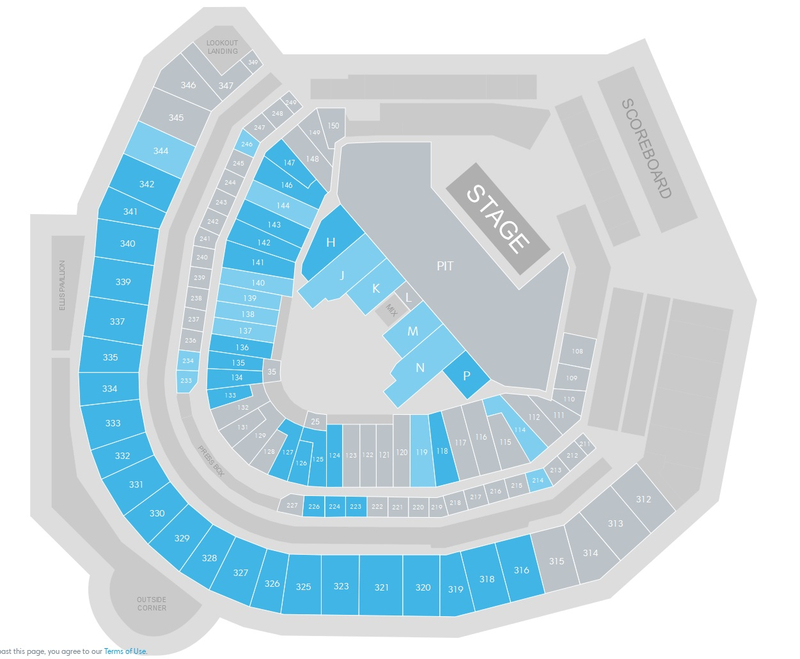 Will probably try TM for Seattle 2 for seats. Had the worst day at work and came home to find out I won Wrigley N1 GA. Thank you ticket gods. 8/18 Fields and 8/20 Stands were my 2nd and 4th choices, respectively. Waited for that email for so long that I began reasoning with myself about how it wouldn't be so bad if all my choices fell through and my card wasn't dinged $500 just like that. Between PJ and Phish tickets this past week, I think I'll be shredding and then burning my credit card statements without looking at them for the next few months. When will you know where you reserved seat is? Just when you walk in? At 6:33 I got the email telling me I'm a winner! I put in for Wrigley 1 reserved only and got it! Still waiting. Still have faith!! Pittsburgh 4/26/03, State College 5/3/03, Reading 10/1/04, Toledo 10/2/04, Toronto 9/19/05, Pittsburgh 9/28/05, Cleveland 5/20/06, Pittsburgh 6/23/06, Cincinnati 6/24/06, Washington D.C. 6/22/08, Cleveland 5/9/10, Pittsburgh 10/11/13, San Diego 11/21/13, Los Angeles 11/23/13, Los Angeles 11/24/13, Oakland 11/26/13, Missoula 8/13/18. Keep the faith. 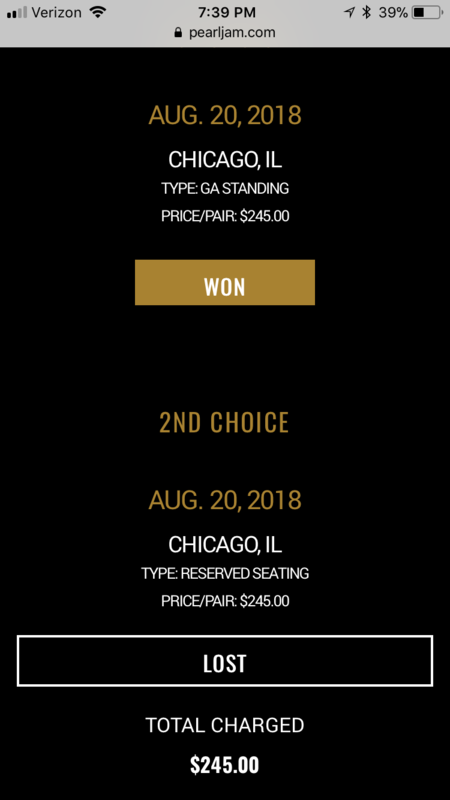 I just found out Wrigley 2 GA. First and only choice. I'm legit going to break my F5 key! People who just found out, when did you make your final entries?